This 118-mile railroad, completed in 1891, made it possible for the interior of the western and central Adirondacks to be more widely settled and to prosper economically. The entire corridor was listed on the State and National Registers of Historic Places in 1993. Passenger service ended in 1965, freight service ended in 1972, and New York State purchased the abandoned line in 1975. In 1992 a volunteer organization formed to create the Adirondack Scenic Railroad (ASR) , which now carries nearly 80,000 people on the southern tier (Utica to Big Moose) and 15,000 on the northern tier (Lake Placid to Saranac Lake). In early 2016, New York State signed off on a Department of Environmental Conservation plan to shut down the northern tier rail service and rip up 34 miles of tracks from Lake Placid to Tupper Lake to build a recreational trail. 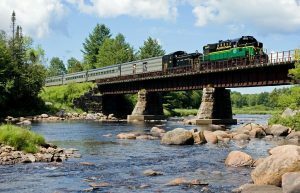 The Adirondack Scenic Railroad has filed a lawsuit in State Supreme Court to stop the destruction of this section of the corridor. 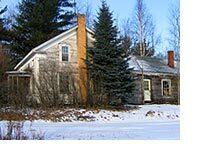 Read AARCH’s Fact Sheet: Save Remsen to Lake Placid Rail Corridor. 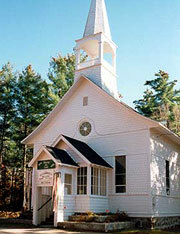 The Wesleyan Methodist Church (West Chazy, Clinton County) was erected in 1880 and used until 1915 when a new church was built across the street. The old church served for many years as L. G. Robinson’s Hardware and Lumber Store. The building has sat idle for many years. Currently St. Gabriels Church (Paul Smiths, Franklin County), although vacant is still owned by the Catholic Diocese and under oratory status. 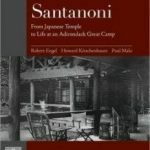 However, that status cannot be extended beyond ten years; according to the deed, once oratory status expires (November 24, 2012), the property reverts back to the previous owner, in this case, Paul Smith’s College. The college is interested in owning the building and restoring it for its use as a chapel and meeting place for student activities. Until this transpires, St. Gabriels Church is considered endangered. The Daniel Ames House on NYS Route 86 (North Elba, Essex County) is an early 19th century Greek Revival style house that is unoccupied and deteriorating. 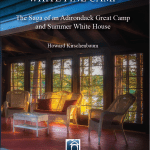 It is owned by and on the grounds of the Saranac Lake Golf Club. Aiden Lair, a well-known inn and stagecoach stop on Route 28N in Minerva (Essex County) is vacant and continues to deteriorate. Time is rapidly running out if this important roadside establishment is to preserved. 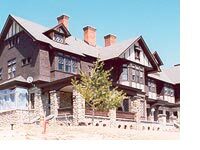 Wellscroft in Upper Jay, a Tudor Revival style house built in 1903 for Jean and Wallis Craig Smith of Saginaw, Michigan, included a 15,000 square foot main house, caretaker’s house, children’s playhouse, firehouse, powerhouse, and carriage house. Twice abandoned in the 1990s and extensively vandalized, Wellscroft appeared on AARCH’s “Endangered Properties List” for several years. 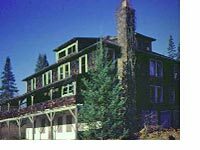 It had recently been restored, operating as an inn. It was offered for sale through auction last year, but it appears that there were no buyers and it is currently on the market, brokered by Persons Real Estate.. There are three National Register-listed historic bridges over the Ausable River that face a very uncertain future. They are the River Street Bridge (1878) in Keeseville, the Old State Road Bridge (circa 1900) in Ausable Chasm, and the Walton Bridge (1890) in Keene. All have been closed to traffic and there are no current plans, by the Essex and Clinton County Departments of Public Works, to rehabilitate and reopen them. 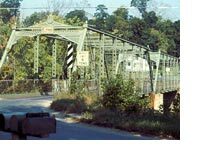 The River Street Bridge, the oldest Pratt Through Truss Bridge in New York State, is one of only about 75 cast and wrought iron bridges in the United States, and is also listed as a National Historic Civil Engineering Landmark. In 2007, Essex County had an engineering assessment done for the bridge and is now, with support from AARCH, exploring various rehabilitation options. The Old State Road Bridge used to carry all of the northsouth traffic on NYS Route 9 until it was bypassed in the 1930s. This pony truss bridge also has a cantilevered sidewalk that allows pedestrians to view Rainbow and Horseshoe Falls at the entrance to Ausable Chasm.